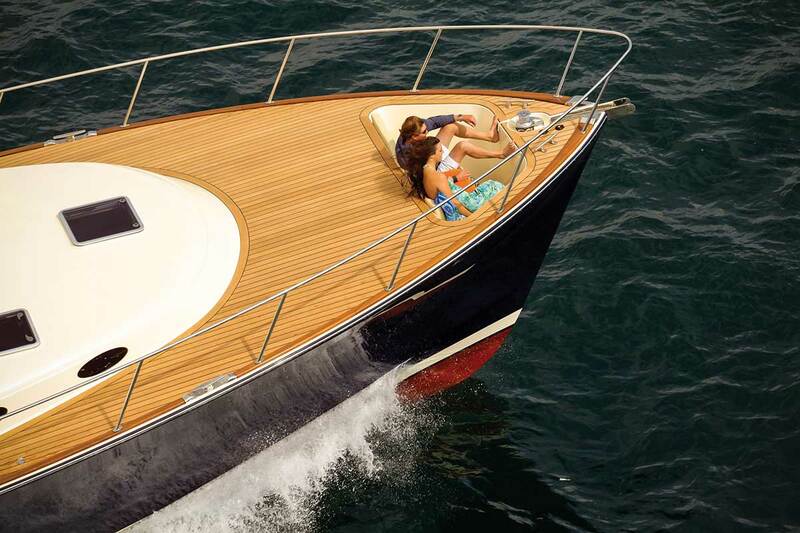 Forget the fact that the Palm Beach 65 was one of the most beautiful boats I’d ever seen—sleek, low, classic lines, and exquisite fit and finish. It was the ride that was really impressive. On a late summer afternoon in Long Island Sound off Rowayton, Connecticut, I put the wheel all the way over at 25 knots. The boat simply turned and kept almost level, with absolutely no muss or fuss whatsoever. The motion was as solid as it could be; nothing even creaked as it completed one circle and prepared to do it again. That’s when I realized that this new Palm Beach flagship—the line now stretches from 42 to 65 feet—was a special boat, one with a rare combination of stunning looks and exceptional performance. It was obvious that others shared my opinion, since almost everyone we passed waved and smiled when they saw this big, three-stateroom, three-head, flybridge motoryacht go by. 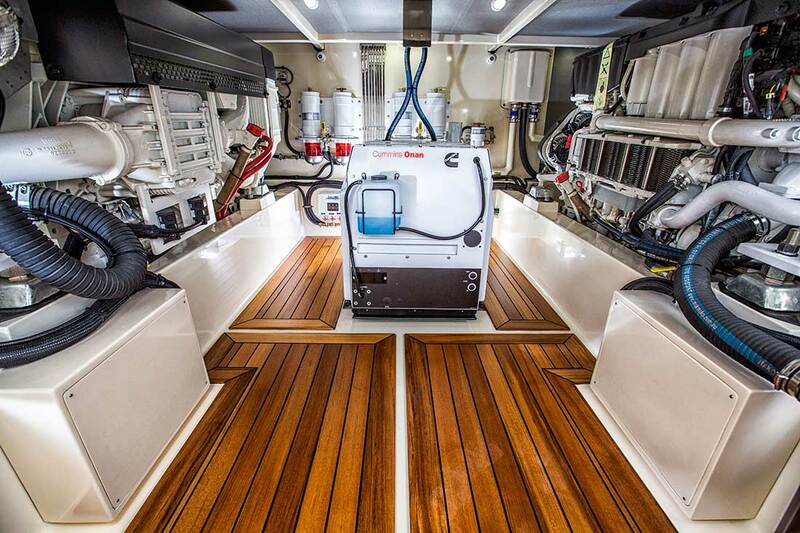 The Palm Beach 65 is definitely a boat that garners attention. The 65’s performance at both low and high speeds is impressive as well. 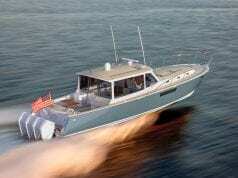 With three of us on board—me, Dave Northrop, Palm Beach’s VP of sales and marketing, and Carvey Iannuzzi, the Palm Beach broker in Fort Lauderdale—plus about 1,400 gallons of diesel fuel and a 10.5-foot tender in the garage, the boat came up on plane easily with almost no bow rise at all, and then, pushed by twin 900-hp Volvo diesels and straight shafts, it topped out at 30.2 knots. (Volvo IPS pod drives are an option.) 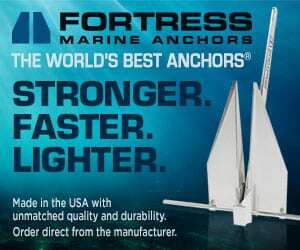 Bow and stern thrusters made docking easy. 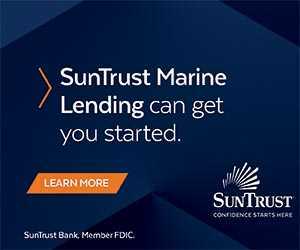 The person most responsible for all this is Mark Richards, an Australian who signed up as an apprentice boatbuilder in Pittwater (about 20 miles north of Sydney) when he was 17, then became a champion sailboat racer. Richards has won the treacherous Sydney-Hobart race an unparalleled eight times. He launched Palm Beach Yachts in 1995—the town of Palm Beach, Australia, is just up the coast from Pittwater—drawing on his sailing experience to use high-tech materials for lightweight yet rigid hulls with almost avant-garde interpretations of classic design. In August 2014, Palm Beach was acquired by Grand Banks, and Richards was named CEO of both companies. 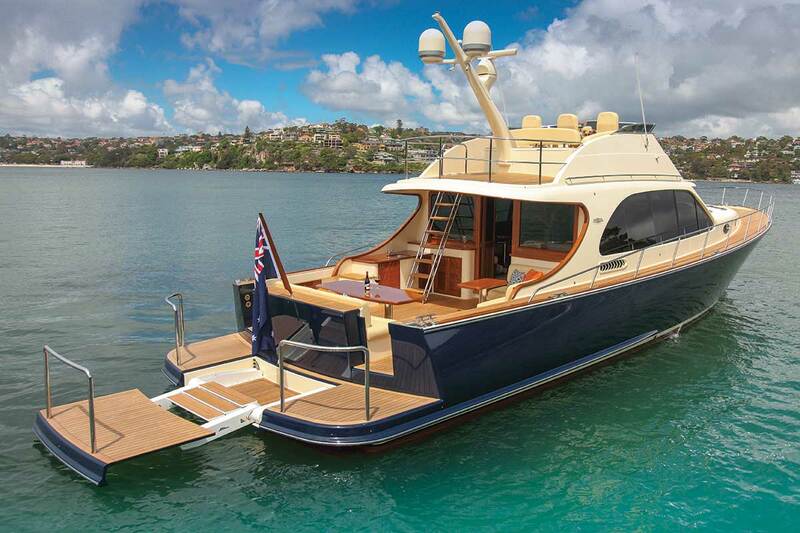 The Palm Beach 65 debuted at this fall’s Newport show and welcomed the many lookers boarding via the large teak swim platform. A sliding door on each side opens to the cockpit; they recess into pockets in the wide transom. As for attention to detail, the bottom of the port-side door has a cutout for the shore cord. Aft, a bench settee across the transom offers alfresco dining on a highly varnished teak table supported by two stainless pedestals. An L-shaped settee is forward on the starboard side, with another teak table on one stainless pedestal. There’s also a cockpit wet bar with a Silestone countertop, fridge, freezer, sink, storage, and glassware cabinet. 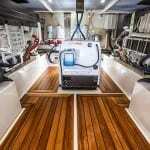 In the cockpit, you can push one button to raise or lower the swim platform; push another, and the entire cockpit sole and transom lift up to reveal the garage with a 10.5-foot AE RIB powered by a 20-hp Yamaha. A trolley system launches it over the swim platform; use the power winch to retrieve it. 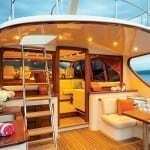 The flybridge is up eight teak steps from the port side of the cockpit. 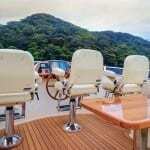 Three Stidd helm chairs face the centered helm, with a teak wheel and one Garmin screen. 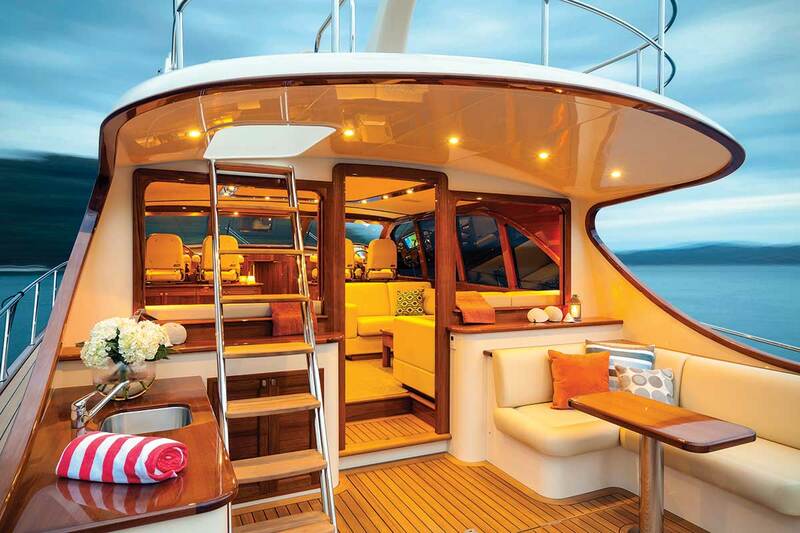 An L-shaped settee and polished teak table are on the starboard side. Access to the gel-coated engine room is from a hatch at the forward end of the cockpit and down three teak steps. A big Grocco strainer is at the foot of the steps. The Cummins Onan 21kW genset is centered and flanked by two 900-hp Volvo diesels. Though it’s laid out well, headroom is not abundant (a tradeoff for the boat’s low profile), but there’s plenty of room to walk around the front of the Volvos to reach the outboard sides. Each engine has two Racors. 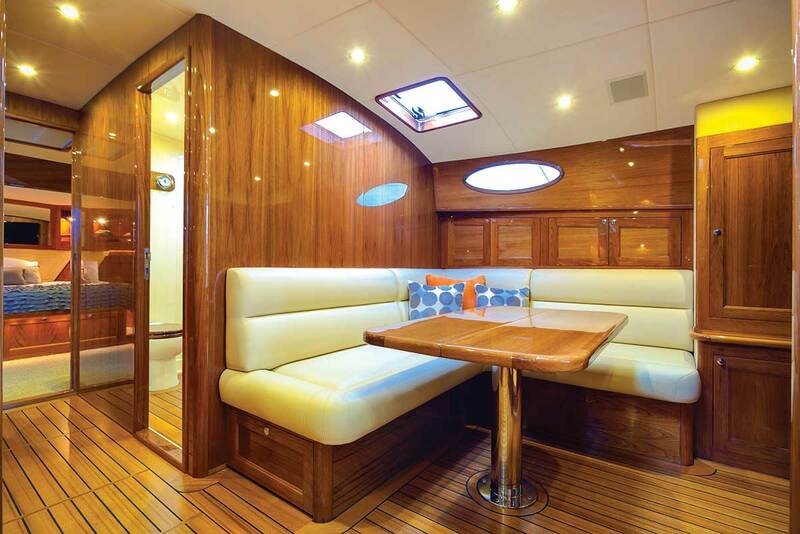 The salon is one teak step up from the cockpit through a bi-fold teak and glass door. Two large rear windows are on either side of the door, and they can be lowered at the press of a button. Palm Beach builds semi-custom yachts, so no two are the same. On this one, an L-shaped settee and folding teak table that seats six is to port; two sofas face each other on the starboard side forming an inviting social area. The entire salon is filled with beautiful Burmese teak and light from the large windows all around. 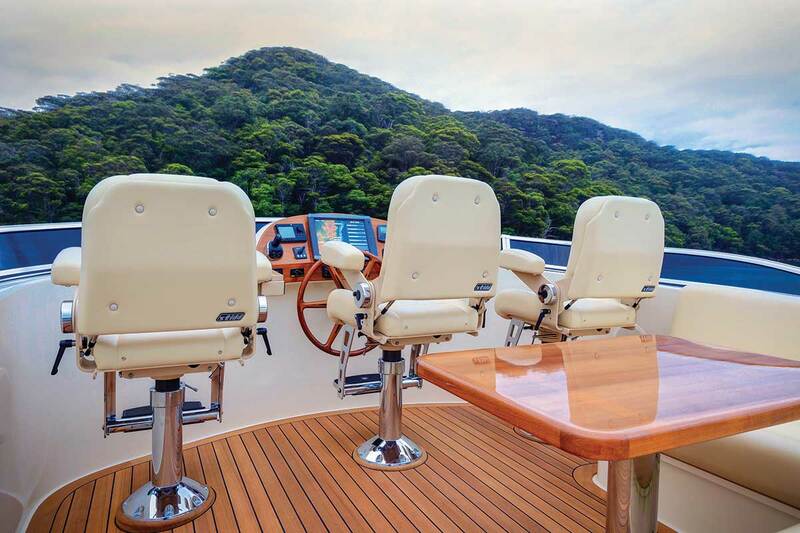 Forward up one teak step, the helm seat to starboard can hold two or three adults and faces a teak wheel and the easy-to-read, gently curved instrument panel with two Garmin screens. The side window next to the helm and the one next to the galley go all the way down with a push button. 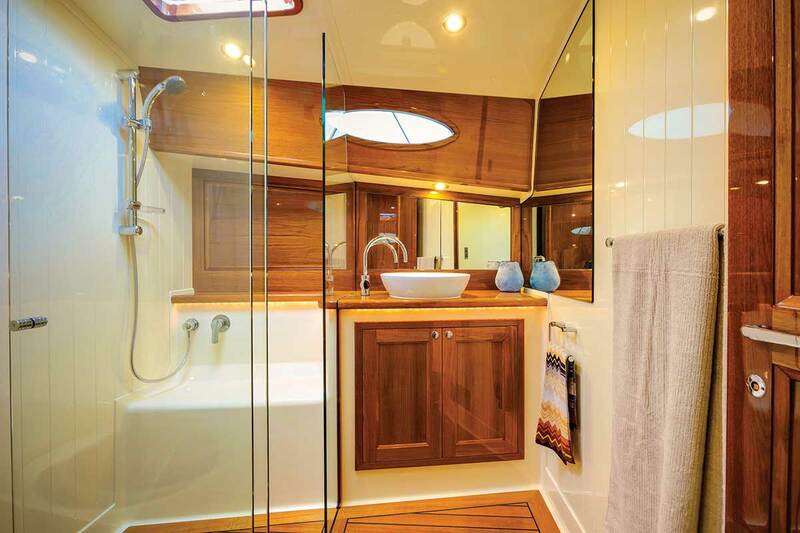 The helm window opening is large enough that you can step out to the side deck to help with docking if needed. The L-shaped galley is large and bright, with lots of countertop, storage space and Miele appliances: four-burner cooktop, oven, microwave, and dishwasher. Signature Palm Beach bone china is in a cabinet behind the helm; a drawer holds Palm Beach cutlery. Two teak steps lead down to the accommodations deck. To starboard, the massive master stateroom is so big it even has room for a residential-sized Miele washer and dryer and large storage area aft. 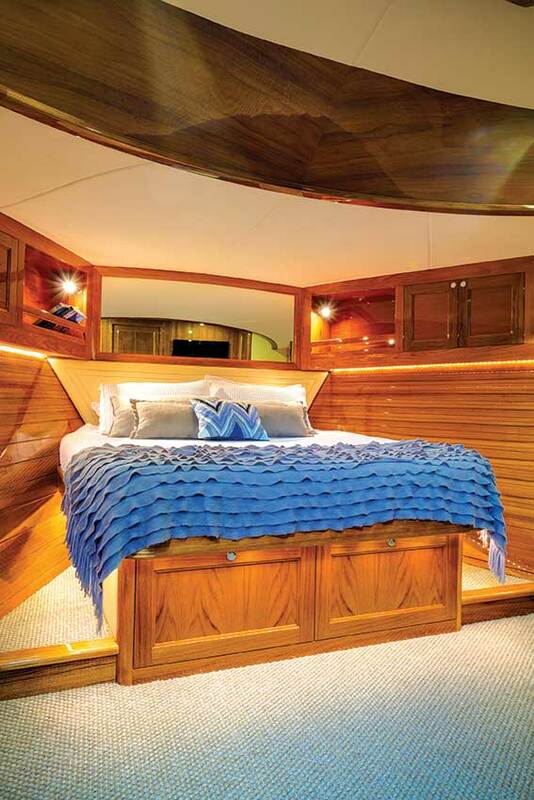 The headboard of the walkaround king-size bed is against the starboard side and flanked by oval porthole windows. A walk-in closet is of ample size, and the large ensuite head has a generous shower behind a glass door. An overhead hatch lets in lots of light. The VIP stateroom is forward, with a walkaround queen bed, and six-foot-plus standing headroom at the foot of the bed. Its ensuite head with shower is just a bit smaller than the one in the master. 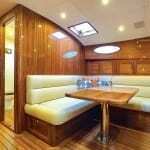 The cozy third stateroom—suitable for children or crew—is tucked under the galley on the port side. A day head is just forward down the companionway. Richards drew from his racing experience to reduce weight while adding rigidity to Palm Beach hulls, which are built with composites of stitched E-glass, vinylester resin, a layer of Core-Cell foam, and a vacuum-infusion process. 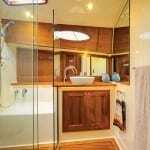 All panels and tanks are bonded into the hull; bulkheads and fixed furniture also are bonded to the hull and deck for extra strength. 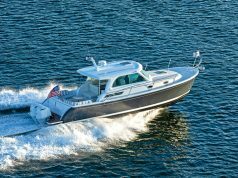 The 65’s semi-displacement hull has a warped bottom, starting with a 37-degree deadrise at the bow and ending with 6 degrees at the stern. 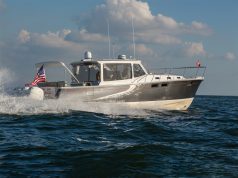 It’s an efficient hull design, but it’s also smooth, strong and, as evidenced by the appreciative looks from those on land and on other boats, it’s eye-catching as well. On our way back to the dock we passed a picnic boat with two men on board who did a double-take, smiled and waved.